← Saab Wins 1956 Great American Mountain Rally! 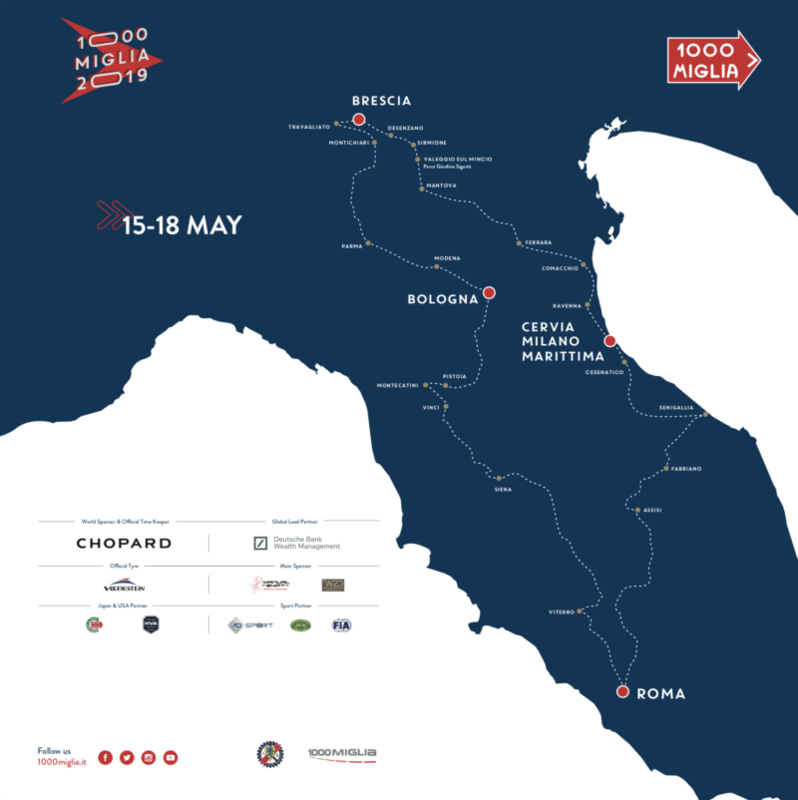 In 2019 the prestigious Mille Miglia rally will be held from May 15 to May 18. As always the Mille Miglia will consist of the circular route that begins and ends in Brescia, Italy. The route of the rally is shown below. Overnight stops are identified by the red circles on the map below. The Mille Miglia is always very difficult to enter due to the rules about the cars that are acceptable. In addition, there are always more entrants than available spaces in the rally. In the past few years the available spaces has been increasing, but in a reversal of that trend, in 2019 only 430 entries will be accepted, down from 450 entries last year. For all those wishing to take part in the 2019 Mille Miglia, it will be possible to register online starting from Tuesday October 23, 2018. This entry was posted in Uncategorized and tagged Mille Miglia. Bookmark the permalink. This is my dream to joint that event. If so my car will be ready for next year (2020) even. Hi Artur! I also sent you a private email message on this matter. Your car is too modern for the Mille Miglia. The cars have to be cars that could have or actually did compete in the original Mille Miglia.